EcoNet Controls of Clearwater Florida, a manufacturer of “Unique Home Automation Devices & Solutions”, has released an updated version of its popular water shut off controller. The mechanics of the unit have been updated with an improved open/close stroke and the addition of a Universal Mounting Kit (UMK). 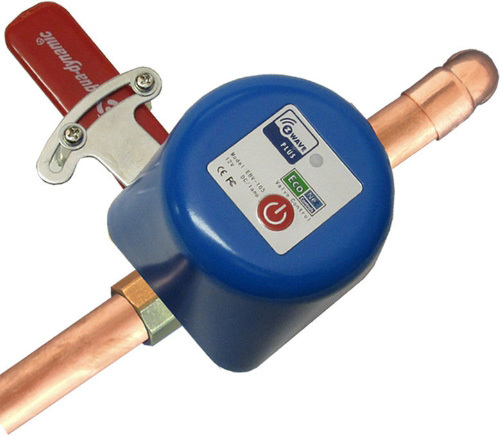 The UMK supports simplified mounting of the unit over existing ball valve sizes of ½”, ¾” and 1″; no plumbing is required. The unit pairs as a standard Z-Wave Switch or “Valve” and is compatible with most Smart Home solutions including Vera, SmartThings, Homeseer and Nexia. The EBV105-UMK is also compatible with professional systems from Honeywell, ADT and Control4. Adding this DIY type solution to a Smart Home can prevent water damage. A typical system setup would include water sensors and be configured to send a “water leak” notification to the home owner’s Smartphone and automatically shut off the water, preventing damage and expensive home insurance claims. Any computer or smart phone can be used to control, manage and configure this Z-Wave Plus certified device, from anywhere internet access is available. Although the device only requires 12V DC (1A) input, it has been mechanically geared with high torque and power to easily manage standard levered ball valves. The close and open cycle is a 90 degree turn that takes about 10 seconds. A clutch release allows hand operation of the valve in case of a power loss. The open/close stoke can also be controlled manually with the power/pairing button. A blue LED acts as a status and “condition” indicator. The EBV105-UMK package comes complete with the valve controller/motor, AC Adapter, the Universal Mounting Kit and quick user and installation guide. Installation takes 5-10 minutes and no special tools or skills are required. The EBV105-UMK is available now and has a list price of $135 U.S.
EcoNet Controls, a division of ICI Controls, Inc., was formed in 1993. EcoNet designs and manufactures products with a focus on Unique Home Automaton Devices & Solutions.